The reviewed received a copy of the book from the publisher. The winners of the 2013 Boston Globe-Horn Book Awards were announced recently. The nonfiction winner this year was Electric Ben. Two books were name nonfiction honor books: Dreaming Up: A Celebration of Building and Hand in Hand: Ten Black Men Who Changed America. If you haven't had a chance to read Dreaming Up, you need to seek out this book. It's amazing! 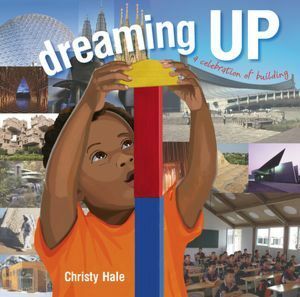 This nonfiction picture book by Christy Hale incorporates poetry, architecture and children at play. Don't be fooled by the young boy pictured on the cover, Dreaming Up will appeal to a wide range of readers from grades K-4. Each two-page spread contains a poem accompanied by a mixed media illustration on the left side of the page. The illustrations depict children building with material such as cups, cardboard boxes, sand, Legos, and playing cards. The right side of the page includes a photograph of a building related to the poem and the illustration. Not only do the illustrations and photographs show specific architectural designs, but the poems take the shape of the design as well. For example, the Sclera Pavilion in London is shown near the end of the book. "Vertical slats of wood were used to create this circular building." In the illustration, two boys are pictured glueing popsicle sticks to a round container. The poem on that page is written in vertical lines that reflect the same structure as the Scelra Pavilion. Dreaming Up would make an ideal read aloud. With the combination of poetry, architecture, creative play, and artwork, readers will find many aspects to discuss in a group setting. Children will also enjoy learning more about the architects and their designs in the pages at the back of the book. Readers may become inspired to experiment with design as they build their own structures out of everyday material. Visit Christy Hale's web site to view pages from the book. Thanks for bringing Christy Hale's book to our attention. Your piece shares how it has such an inviting premise, to guide kiddos into a topic usually not covered in nonfiction. Little children are natural builders but then as they grow up, so few go on to be architects & builders, especially girls. This book incorporates visual art & the literary art of poetry with the science of building & that's a rare treat. This sounds wonderful. I find that boys and girls are interesting in buildings and architecture but there aren't many books that grab their attention. This one looks perfect! Will be hunting it down!